Get the most out of your storage space with the extreme speed of iSCSI and the efficiency of iSCSI thin provisioning. Connect through iSCSI for the fastest data transfer speeds available and make wasted disk space a thing of the past with thin provisioning’s flexible storage functionality. 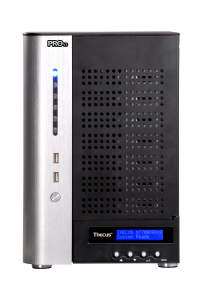 Thecus NAS products are ready for a number of emerging technologies. Through the built in PCI-e slot, business users can add a 10G Ethernet Adaptor for lighting fast transfer speeds.